Low cost: Compared to their mutual fund counterparts, ETFs already have the advantage on expenses, and I am still looking to reduce the overall cost of ownership. WPS, BIV and BWX haven’t been around yet for three years so I put your for full 10 percent for REITs into VNQ and distributed your 10 percent for bonds between SPY and EFA. 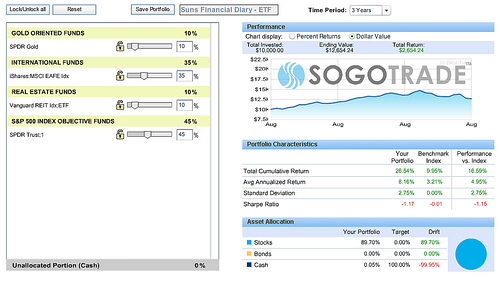 The screenshot of the 3-year performance of my all-ETF portfolio is attached (click to enlarge). Though the performance doesn’t reflect exactly what I have in the portfolio because of the absences of several fund, it Isn’t too bad, is it? Actually, I am considering making a small change on the domestic stocks fund. My current choice is SPY, which is a large-cap fund. But I also like small-cap a lot, despite the recent lackluster performance of this category. In the long-term, the small-cap has shown to proivde better return than the large-cap. What I want to change is reducing SPY’s allocation to 30% and adding Vanguard Small Cap Value ETF [[VBR]] to the mix with a 10% allocation. I think adding a small cap value would be a good choice. 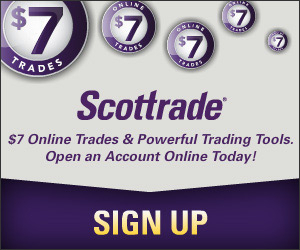 Do you enjoy using sogotrade?